The Cheyenne TV show was a 60 minute western action series on ABC and was based on the 1942 movie of the same name starring Dennis Morgan. In the movie, Cheyenne Brodie was a gambler but on the television series he became a drifter who performed a variety of jobs. Amoung others, he was an Army scout, a scout for a wagon train, a deputy sheriff and a foreman on a ranch. In nearly every episode, Cheyenne Brodie would fight either Indians or bad white guys and, of course, there was usually a beatifull woman involved. Cheyenne Bodie had a fellow drifter in the first season (Smitty). For the rest of the series, he roamed from place to place all alone. The Cheyenne TV show actually started as one element of "Warner Bros. Presents" which was the studio's first attempt at television! There were two other series, "Conflict (1956-57)" and "Sugarfoot (1957-59)". They would air on a rotating basis. Cheyenne was by far the more popular of the three. For part of the 1959-60 season, a new program was added titled, "Shirley Temple's Storybook". It soon moved to NBC as its own series (retitled: The Shirley Temple Show). Then, in the 1960-61 season, the name was changed to "The Cheyenne Show". 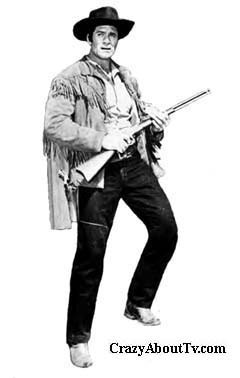 Most episodes featured Clint Walker on this program but there were also episodes of "Bronco" and "Sugarfoot" was also occasionally back in the mix. The following season, "Sugarfoot" was dropped again and only "Cheyenne" and "Bronco" episodes remained. In the final season, Clint Walker finally got his own weekly program which appeared every week! "Bronco" was actually a "spin-off" of this program. In 1958, Clint Walker (Cheyenne Brodie) demanded that the studio renegotiate contract he signed as a totally unknown actor. Amoung other things, his original contract required him to pay the studio 50% of any fees he got for personal appearances! Well, the studio said they wouldn't change the contract at all and Clint Walker walked off the set for a year. During that time, Ty Hardin carried the episodes as "Bronco Layne" and became so popular that Warner Bros decided he merited his own series. They also reached a settlement with Clint Walker and he returned. Clint Walker had some good real-life experience for the TV show. He actually worked as a Deputy Sheriff and a Cowboy! His role of a job-drifter was eerily close to real life too! He also worked as a Merchant Marine, carpenter, salesman, lumberjack, private detective, prospector, oilfield worker, truck driver, singer and an actor! By: "Stan Jones & William Lava"
But will the wild wind one day cease and you'll no longer roam. Move along, Cheyenne the next pasture's always so green. Thank you for visiting our Cheyenne TV show page!